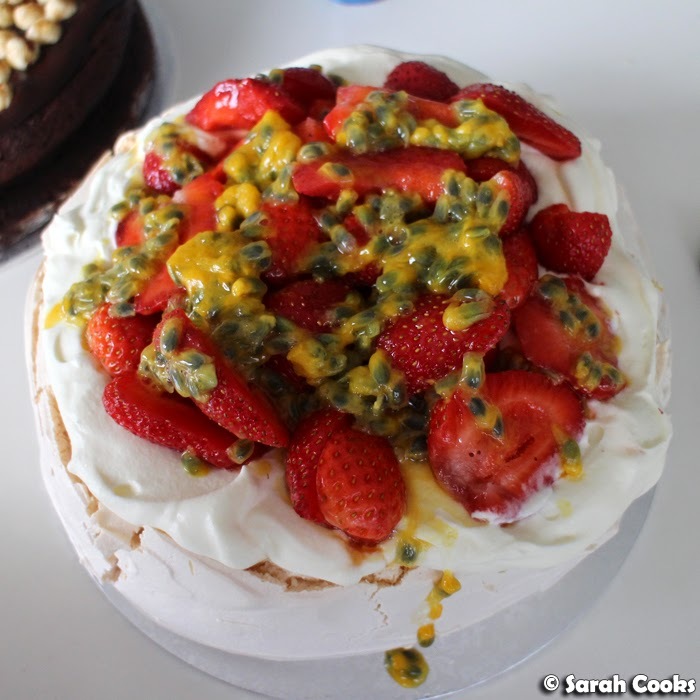 Sarah Cooks: A cacophony of cakes and a Brazillian buffet - Happy Birthday Daisey! 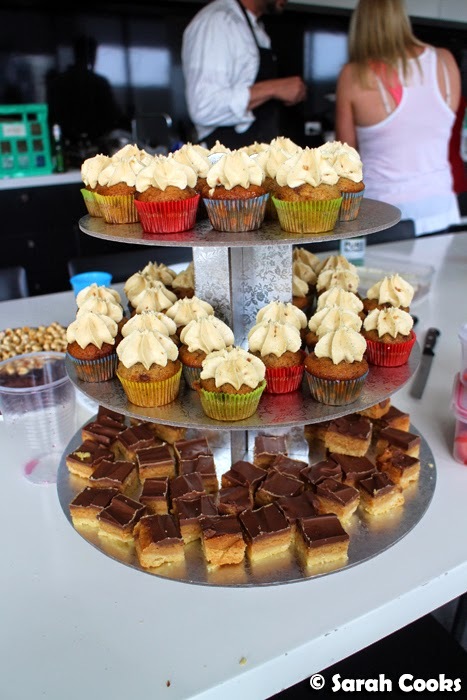 A cacophony of cakes and a Brazillian buffet - Happy Birthday Daisey! 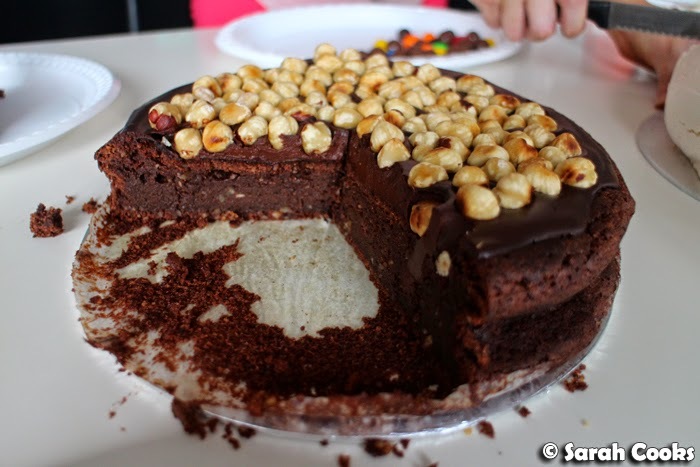 When I told you about The Jimbo Cake a little while ago, I also told you that I did (quite!) a bit of baking for my friend Daisey's birthday party. 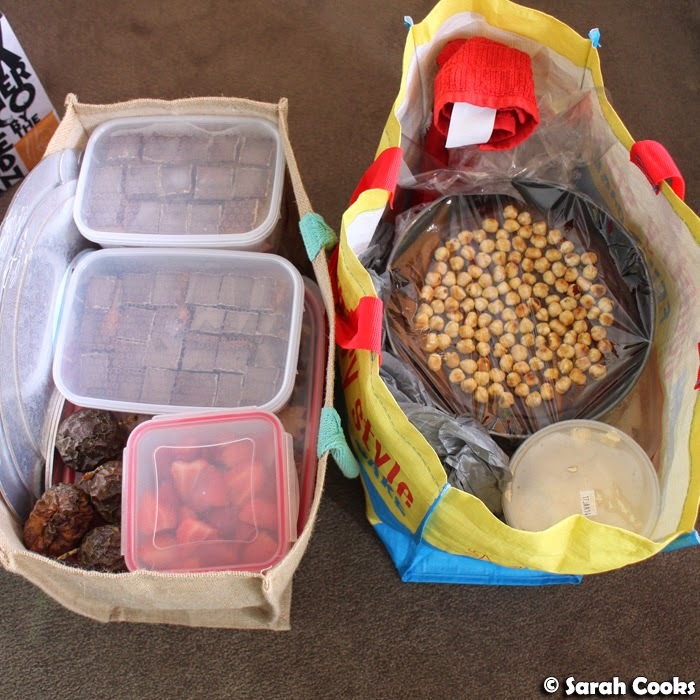 She knows I love to bake, so asked if I'd be happy to bake some cakes and desserts whilst a Brazillian chef friend of hers made savouries for the party. It was a no brainer - of course! 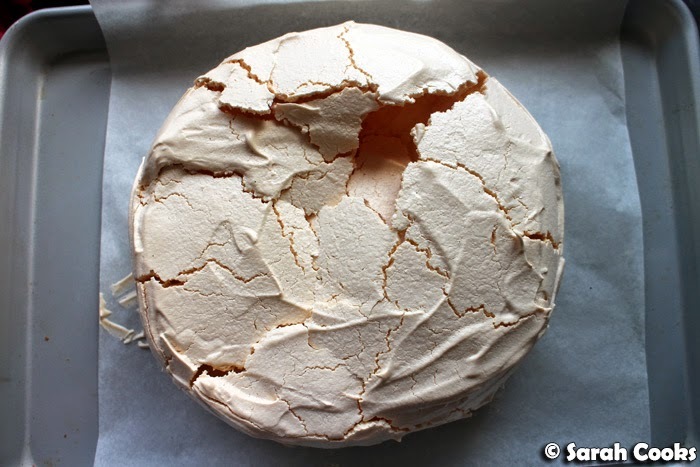 A pavlova - always delicious, good for coeliacs, easy, and cheap (even though Daisey paid for the ingredients, I always have loads of egg whites in the freezer so any excuse to use them is welcome!). I'm getting better at pavlovas, this time it was almost perfectly round and the sides were nice and high. (The cracks and dents in the top eventually get filled with cream, so no need to be too precious about those). 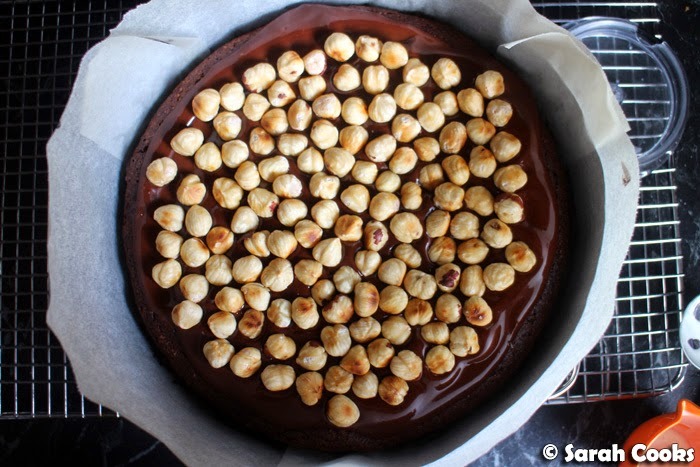 And here it is topped with ganache and toasted hazelnuts. 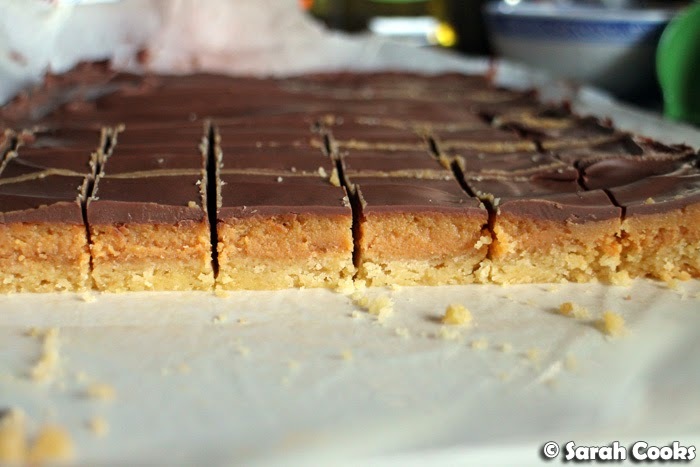 Also on the list was a caramel slice (recipe on the back of the tin of condensed milk)! ... and some lemon slice. So, on the morning of the party, I packed everything away carefully, put it in the car and started to drive to the train station... only for my car to break down! Argh!! Disaster! We had to call roadside assist, wait ages for them to arrive, only for them to tell me they couldn't fix my car there and then, and it would have towed back home. It was another thirty minute wait for the tow truck, and then we got my car safely parked, then finally called a cab... and the driver had no idea how to get to the destination, drove incredibly slowly and even stopped at green lights. Green lights! Needless to say, my stress levels were through the roof! We arrived at the party two hours late, but luckily all the food was fine and no-one seemed to mind that the cakes were a bit late. I definitely needed one (or three) of these! Phew! 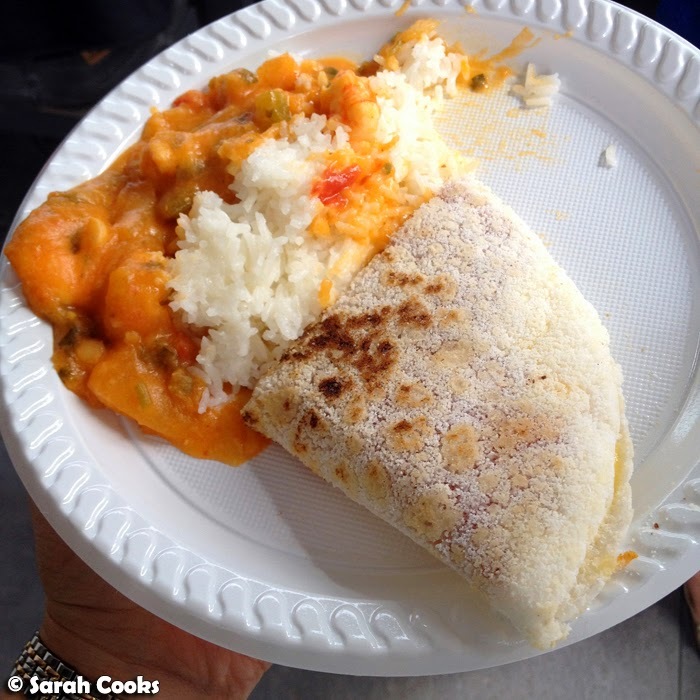 Let's have a look at the yummy food that Brazilian chef Claus made! 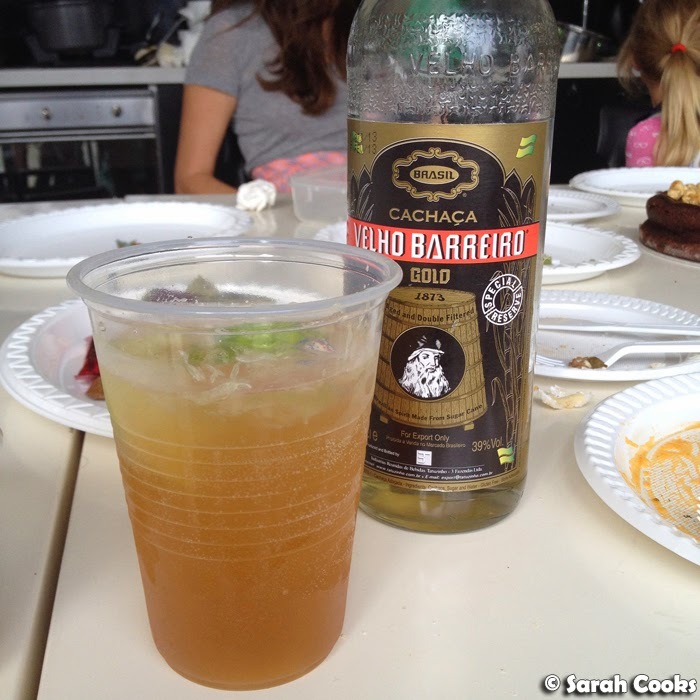 I didn't get a picture of these, but totally loved the pão de queijo (cheese bread) he made. Think little cheese puffs - super addictive! 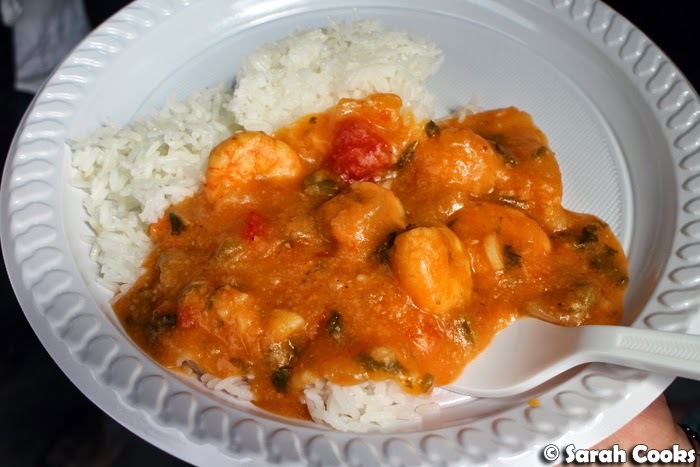 Here's a plate of bobó de camarão - a prawn stew with tomatoes, manioc (cassava) flour, coconut milk and tomato. So delicious! He also made these fab crunchy cassava pancakes. 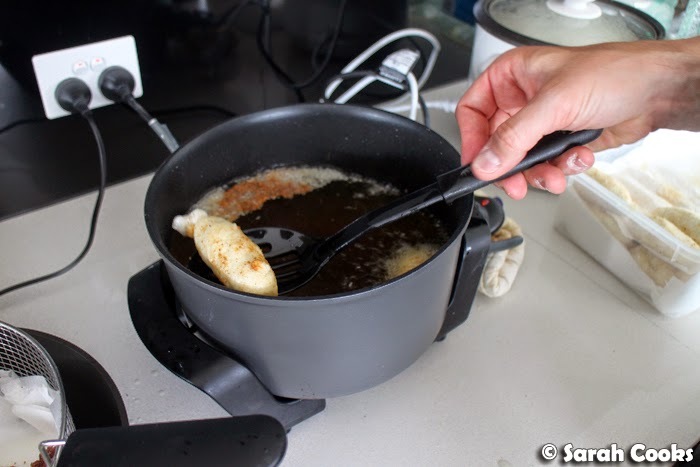 You grate cassava into a dry pan and it magically cooks and melts into a big crispy pancake. 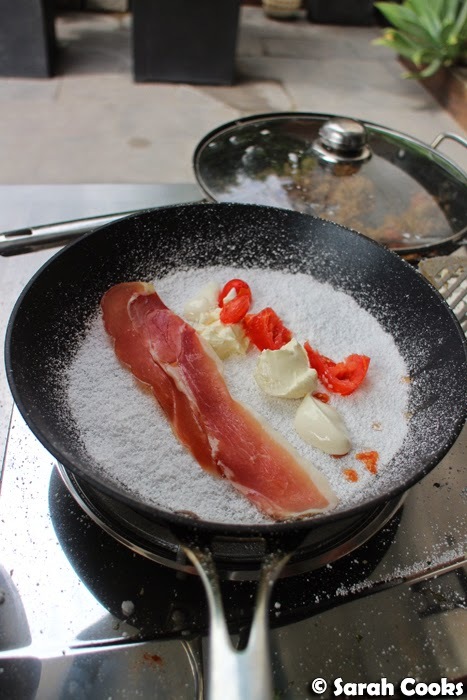 I think you can put whatever you want in them - mine had prosciutto, cream cheese and tomato - yum. And finally, there were these great bolinhos. Bolinho just means "ball" (hehe). 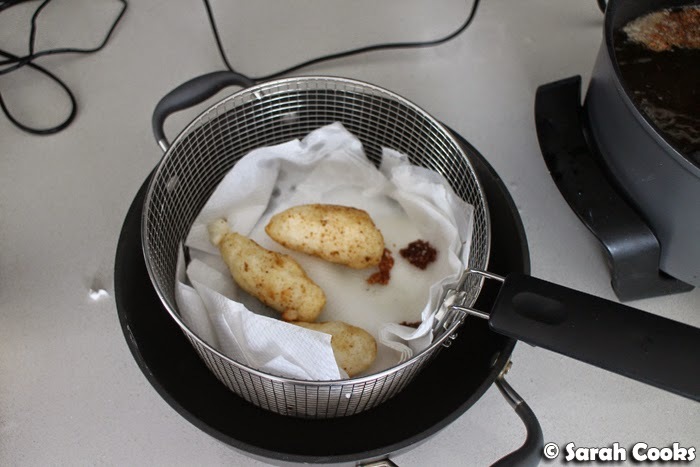 I've made salt cod bolinhos de bacalau before - fabulous. 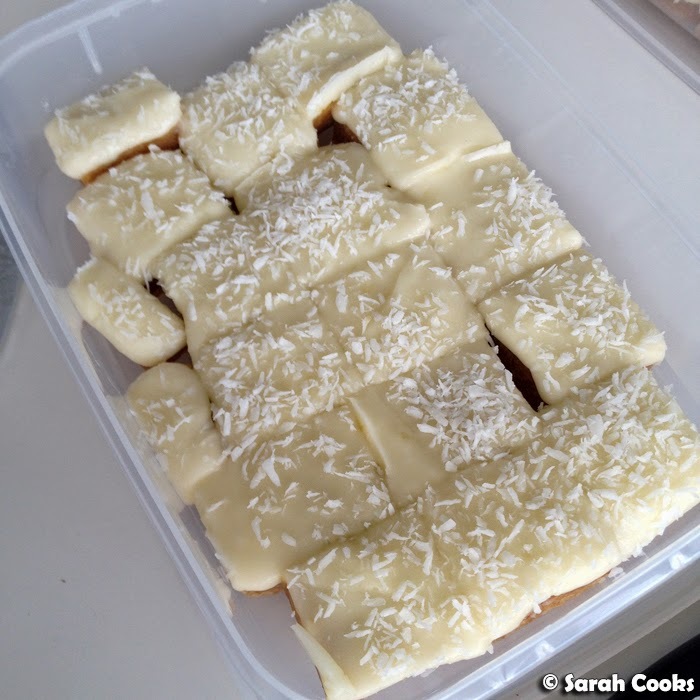 These ones were made with cassava dough, and filled with either minced beef or cheese and olives. 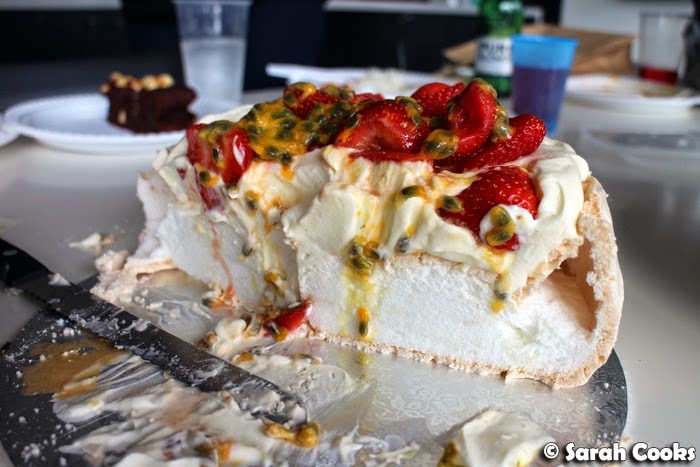 My work wasn't quite done - I still had to decorate the pavlova and slice the cakes! 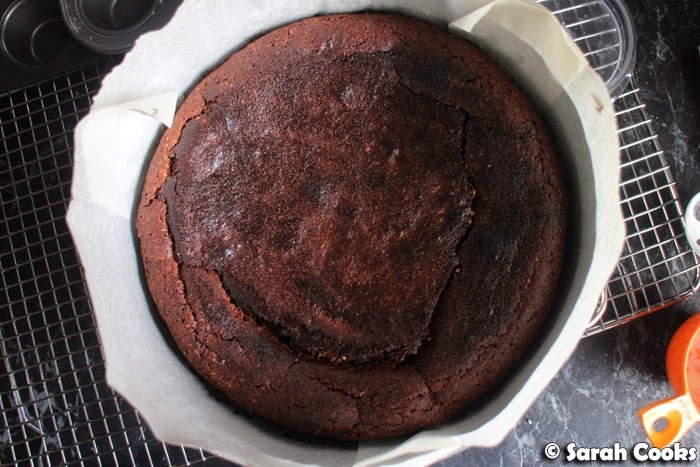 ... and dense squidgy nutella cake. PS My old Brazilian housemate used to make those pão de queijo a lot. Though from a freezer bag, ha!